Today at Computex 2018 in Taipei, ASUS has unveiled a new health-focused wearable designed to accurately measuring and tracking blood pressure. In a break from the general-purpose smartwatch focus of the ZenWatch series, the new VivoWatch BP can last for 28 days between charges, and is instead intended to help the 20 percent of all adults who suffer from hypertension. The device includes grade ECG (electrocardiography) and PPG (optical) sensors in a metal nub on its front face, with the former collecting raw electrical data from the user’s heart, and the latter measuring their pulse. 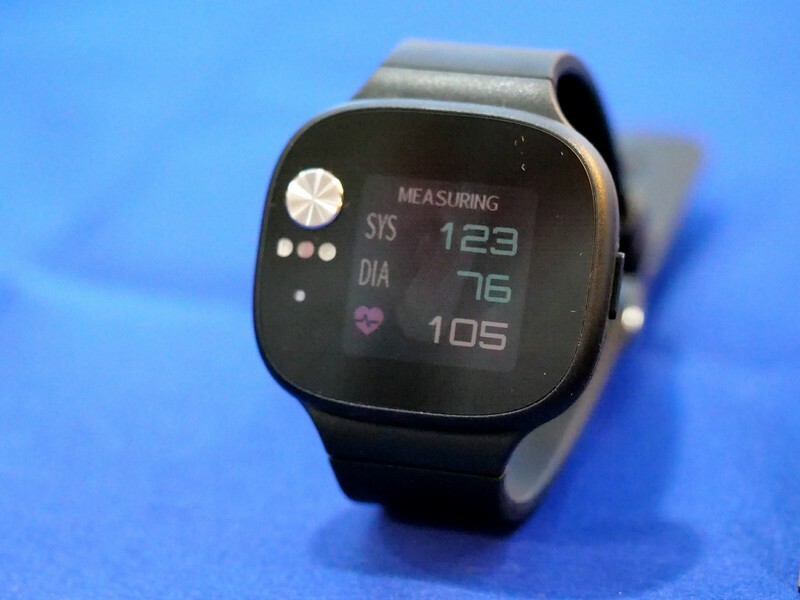 By combining ECG with PPG sensors on the front and back, ASUS says an accurate blood pressure reading can be taken in just 15 seconds, as the user holds a finger on the front-facing metal disk. ASUS’s wearables strategy shifts away from traditional smartwatches. The whole package is significantly smaller and lighter than even the most portable of traditional blood pressure monitors, including the relatively small Vital Moto Mod we saw back at CES in January. The VivoWatch is also a general health tracker, measuring activity, sleep quality, heart rate and stress levels. All this data can then be fed into ASUS’s Health AI software on the user’s phone, which the company says can help people meet their health goals, and provide doctors with more complete data than would be possible with periodic check-ups in a clinic. ASUS didn’t comment on any traditional smartwatch features, such as notification mirroring, in the VivoWatch, but it’s clear that’s not the real focus of this product. This is a health accessory first and foremost, as evidenced by the relatively plain design that’s clearly not intended to compete with more fashion-forward wearables like the Apple Watch. The manufacturer hasn’t given us pricing or availability details for its new wearable, but we’d expect it to be priced in line with other mid-tier fitness watches. ← Drone-delivered meals come to Shanghai, but they’re dropped off by … a human?